Handpicked by President Obama as the host city of last week’s G-20 economic conference, Pittsburgh may finally be getting its due. While most news coverage of the event was more concerned with the art of global financial negotiations than with the artwork hanging on the walls of the city’s museums, a different kind of story caught my eye. That would be Michelle Obama’s selection of The Andy Warhol Museum as the cultural destination to show off to the husbands and wives of the visiting dignitaries. While the heads of state were wrangling over bankers’ compensation and fossil fuel subsidies, their spouses were busy silk screening one of Warhol’s flower images onto tote bags at the museum. If we needed any confirmation that Warhol is an American icon (listen to Studio 360’s homage here), this was it. With the first lady’s endorsement, Pittsburgh’s most celebrated pop artist is now as American as… Campbell’s Soup. Think about it: he was obsessed with fame; he was a product of commercialism if there ever was one; and he was a free-thinking pioneer who remade the world in his own image. How much more American can you get? BTW: We’re eagerly anticipating a visit from another of Pittsburgh’s favorite sons: Pulitzer Prize-winning author Michael Chabon will be on Studio 360 next week to talk about his new book, Manhood for Amateurs. Stay tuned. This might also be the last interview Glenn Gould did, he died of a stroke 6 weeks after the recording. As the Belvedere Torso inspired Michelangelo, Michelangelo inspired Robert Mapplethorpe. The Galleria dell’Accademia in Florence, Italy, has never exhibited a contemporary artist in the revered museum that houses Michelangelo’s “David.” Until now. Nearly 100 Mapplethorpe photographs — with an emphasis on nudes — join Michelangelo’s “David” and his other works permanently housed in the church-like Galleria. “Robert Mapplethorpe: Perfection In Form” is on view until January 2010. I have a soft spot for Mapplethorpe and adore his work. I’ve been a fan since seeing the infamous 1988 exhibition “Robert Mapplethorpe: The Perfect Moment” in Boston. This was just before it went to Philadelphia where the “X Portfolio” caused all of the hoo-ha with the NEA. The photos in question were small, and displayed in a wooden, glass covered case about waist high so that you had to lean over to see into it, the case unmarked. It felt like an accident to see them — or more accurately, like an act of accidental voyeurism. Still, the NEA reaction shocked me, particularly because the obvious focus of the show were his breathtaking flowers, the monumental prints displayed on the walls. It’s not hard to draw parallels between the Michelangelo and Mapplethorpe nudes. Both artists were striving for poetry in form, executing their work with heartbreaking tenderness and precision. “Perfection In Form” is an overdue tribute to Mapplethorpe’s genius. When Johnny Cash listed 100 essential country songs for his daughter, Rosanne, he included one he was famous for singing himself, “Long Black Veil.” In her upcoming album, The List, Rosanne Cash covers twelve of those 100 songs, including the haunting love ballad. More of her conversation with Kurt on this week’s show. Today, “Jennifer’s Body” opens in theaters. Written by Diablo Cody (who recently stopped by Studio 360), this new horror flick tells the story of Jennifer (Megan Fox), a popular high school girl possessed by a man-eating demon. Her best friend, Needy (Amanda Seyfried), is the yin to Jennifer’s yang: unpopular, mousy, a bit of a nerd. But when Jennifer develops a taste for her best friend’s boyfriend, it’s up to Needy to stop her. The web has been buzzing over the sharp script, the beautiful stars, not to mention their on-screen kiss. But the film has also ignited discussion about an unexpected theme: Feminism. USA Today recently ran the headline: “Women Get Their Bloody Revenge in Jennifer’s Body.” And I couldn’t help but think, “Women? Why didn’t it say, “A Woman?” Hmm… That plural seems to include all of us in a weird way. There’s been an explosion of questions: Can a genre movie like “Jennifer’s Body” really say anything significant about an issue as weighty as feminism? Is Jennifer’s character actually a disempowered woman because she becomes possessed through a satanic sacrifice gone wrong? Or is Jennifer a horrific exaggeration of a sexually-empowered, popular woman? Cody told Kurt that the film has less to do with feminism or with girls vs. boys, and more to do with high school culture and the “toxic” friendships between adolescent girls. And although Jennifer crosses that line from “high school evil” into “actually evil,” the comparison strikes a chord. When Needy says, “Hell is a teenage girl,” I imagine that some current and former teenage girls will agree. 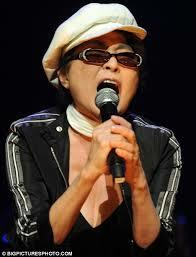 Next week, Kurt will be speaking to musician, artist, and all-around icon Yoko Ono — she has a new album coming out, “Between My Head and the Sky,” on which she collaborated on with her son Sean Lennon. Ono’s work (and life) has raised controversy as well as inspired praise. From her participation in the Fluxus movement of the 1960’s, to her recent collaborations with Cat Power and Peaches, Ono (age 76) remains a viable contributor to the contemporary art scene. It seems that everyone has an opinion about Yoko Ono — if you were in Kurt’s chair, what would you ask her? Add your question below. The interview will air in early October. We’ll let you know if your question makes the cut. On a different note, we were sad to learn that another pop icon of the 1980’s and 90’s, Patrick Swayze, passed away yesterday. The dancer Rasta Thomas was in Swayze’s 2004 movie “One Last Dance” (his wife, Lisa Niemi, wrote, directed, and co-starred). While the clip below is obviously a tribute to Michael Jackson, I think you’ll see Swayze’s influence in there as well.